5 48 Be the first to write a review! 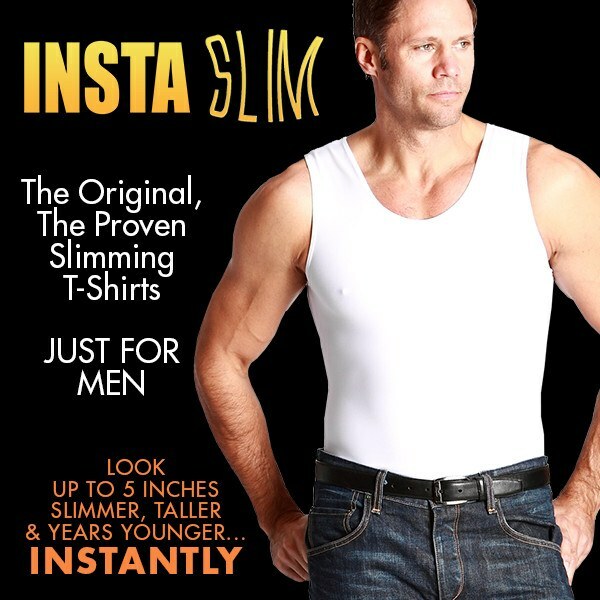 The original, proven Insta Slim Muscle Tank is a unique compression shirt that will make you look up to 5" slimmer and pounds lighter, instantly. This comfortable tank features six support zones to provide lower back support, improve posture, slim your belly, firm and redefine your chest and eliminate love handles. The single layer compression allows is comfortable and discreet under clothing. The Insta Slim Compression Muscle Tank is great as a tank or undershirt. Our high-quality fabric is anti-odor, anti-bacterial, SPF-50, machine washable and made in USA. Made of a special blend of 72% nylon, 28% spandex fibers, making the garment comfortable to wear all day, every day. Can be worn for work or play, as an under garment or outerwear, to exercise and or enjoy a night out on the town. A must have for the man that always wants to look his very best.